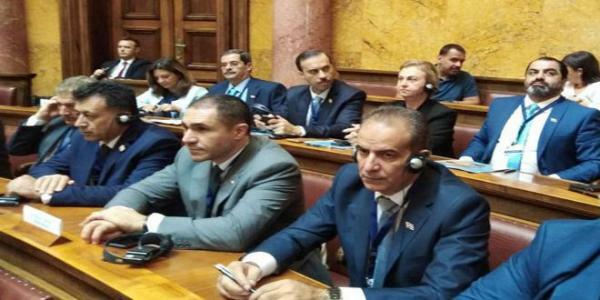 A delegation of the People’s Assembly participated on Thursday in the World Trade Organization (WTO) Parliamentary Conference on the Facilitation of Trade and Investment in the Western Balkans and the Mediterranean Region in the Serbian capital of Belgrade. On the sidelines of the Conference, the delegation held a meeting with the head of the Serbian-Syrian Friendship Association in the Serbian Parliament Miroslav Lazanski. During the meeting, head of the delegation, Fares al-Shihabi, affirmed the importance of strengthening relations between the two friendly countries, calling on the economic figures in Serbia to visit Syria and explore the investment opportunities during the reconstruction phase and participate in the activities of the Damascus International Fair. In turn, Lazanski affirmed Serbia’s support for Syria in its war against terrorism and the solidarity of the Serbian people with the Syrians by sending aid to them much to the dissatisfaction of some Western countries.